It’s cheap, it’s easy, and it’s accessible. Welcome to smartphone-filmmaking, which has become the new trend for both amateur and professional filmmakers in the past year. The trend ― which started about a year ago upon the domestic release of Apple’s iPhone 4 and its local carrier KT’s aggressive-creative promotion of the products ― is becoming even bigger as more capital and talents are getting involved. In the beginning, everything started as a clever commercial strategy. 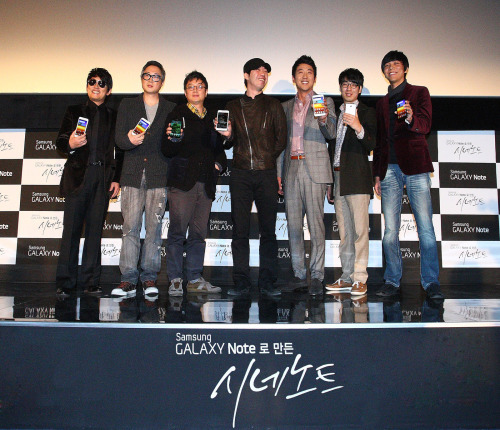 KT Corp., which was the only local distributor of the product when iPhone 4 was released in Korea in September 2010, teamed up with “Old Boy” and “Sympathy for Lady Vengeance” director Park Chan-wook for the promotion of the product. Entirely shot on the iPhone 4, the 150 million won ($133,000) budget movie won the top prize at the Berlinale in 2011. The movie was far from being low-budge production, however. The Park brothers used lighting facilities and extra DSLR lenses to secure its quality. “I think this movie can be a successful example of what happens when art and a corporation that hadn’t done anything with filmmaking do something together,” Park had told reporters before the official release of the film last year. Following KT’s “cinematic” marketing of the iPhone, Samsung Electronics this week unveiled their ambitious PPL-frequent-film project featuring Galaxy Note, their latest Tablet hybrid mobile. Popular actor Ha Jeong-woo played the leading role for all the three of the films, while celebrated musician Lee Seung-cheol produced music using the device for the movie. The team also included noted webtoon artists Sohn Je-ho and Lee Gwang-soo, who created the film’s animated content. Jang Hoon, who made last year’s war blockbuster “The Front Line,” revealed on Monday that he started the project with a bit of skepticism, yet ended up changing his mind. “I was concerned about the picture quality while we were shooting,” he said. Meanwhile, what surprisingly drew young people and amateurs into smartphone-filmmaking last year was arguably the first Olleh & Lotte Smartphone Film Festival, another iPhone-themed event hosted by KT in collaboration with Lotte Cinema. Featuring celebrated director Lee Jun-ik as the jury chief, the last-year event received a total of 470 iPhone-made films and selected five for prizes. Unlike the expensive “Night Fishing” and the latest “Cine Note” projects, however, the film fest produced opportunities for amateur and teen filmmakers who had been longing for access to easy and affordable movie-making. For filmmaker Kang Dong-heon, 35, who won the third prize for his short “Love in Basket” at last year’s Olleh Festival, smartphone-filmmaking was the way to save some cash. He had been in the film industry for “quite a while,” and was in fact working on a project with regular film equipment before finding out about the film festival. Yet just like Park Chan-wook, Kang did not make the film with a single iPhone in his hand. He rented out extra movie equipment, including DSLR lenses, to create depth of field and other cinematic effects for the movie. “You know, now that I’m looking back, I don’t think I would’ve selected my work if I were one of the jury members,” Kang told The Korea Herald. According to Kang, the some of the best features of smartphones as a cinematic medium is their compact size and mobility. Kang picked the second prize winner of last year’s festival, filmmaker Kwon Jin-hee’s “The Idea of Creation” as one of the best smartphone-made films. Filled with quirky humor and imagination, the film was shot from the point of view of a tiny bug. Kwon was invited to the Shanghai International Film Festival for the film. Yoon Jong-seok, filmmaker and one of the jury members of the second edition of the Olleh & Lotte Smartphone Film Festival ― which kicks off on March 9 with a top prize of 20 million won ― said something along similar lines. “We changed our program this year,” he told reporters during a press conference on Thursday. “Everyone has a smartphone,” he said on Thursday. “In the past, the world of filmmaking was dominated by a small number of people, and the rest had no choice but consume the provided content at theaters. Yet anyone can make films thanks to smartphones, and this has brought the most democratized climate for filmmaking. For high school student Kim Da-eun, who is currently working on her submission for the upcoming film fest, the lack of extra equipment is not a problem. She started making films when she was in middle school, using her DSLR camera complimented with video functions. She says using her smartphone makes everything much more fun. “The DSLR camera is too big to carry, and people started staring whenever I tried to shoot outdoor,” Kim told The Korea Herald after her smartphone-filmmaking class at the Olleh Media Studio in Mok-dong, Seoul, Wednesday. “Cine Note” opens in theaters on Jan. 25, while the Olleh Smartphone Film Festival will run from March 19―21. It currently accepts submissions and the deadline is Feb. 12. All submissions must be less than 10 minutes long. For more information about the event and the selecting process, visit www.ollehfilmfestival.com.